A new appreciation of place and of painting, by examining the painting in the place. 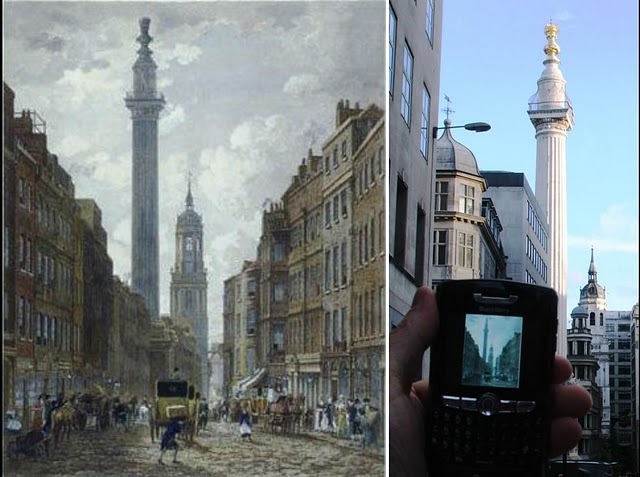 Using mobile devices to access maps of masterpiece landscape (cityscape) paintings, the details of the painting can be appreciated while on the site that the artist studied and painted with such care. Elements of the painting take on new meaning when a modern day equivalent are seen: a passerby or mode of transportation, flora and fauna. The landmark structures become a frame, or a rain gauge that hold the residue of culture. Examples are shown from Greenwich ("The Bellot Memorial", by George Chambers), Amsterdam ("The Bend in the Herengracht in Amsterdam" by Gerrit Berckheyde), London ("View of Fish Street Hill from Gracechurch Street" by William Marlow), Utrecht ("View of Utrecht" by Johannes Bosboom), and the Hague ("View of the Mauritshuis in Den Haag" by van Hove). Great Painters which depicts their "Expression through their Mindblowing painting", Great Artwork!!! Cityscape Paintings for Sale !